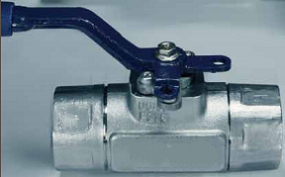 A typical floating type stainless steel ball valve manufactured by Metals Valve, NPT ends. Miscellaneous floating type stainless steel ball valves designed and manufactured by Metals Valve can be categorized as three series: one piece ball valve, 2 piece ball valve, 3 piece ball valve, wafer ball valve, 3 way ball valve, 4 way ball valve. They are mainly furnished in stainless steel 304/304L or 316/316L with floating ball design which are widely utilized in petroleum and petrochemical industry, pharmaceutical piping, water conservancy, urban construction, as well as food and beverage industry. 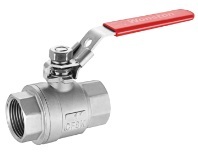 The stainless steel ball valves are available from 1/2″ to 4″ covering pressure ratings of Class 150 ~ Class 300(PN16 ~ PN40). 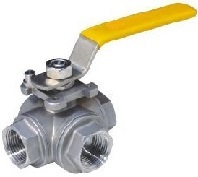 Stainless steel one piece ball valve(single piece design), floating type, lever operated. (1) Stainless steel one piece ball valve heavy type, 1000 WOG. (2) Stainless steel one piece ball valve light type 1000 WOG. (3) Stainless steel one piece ball valve 1000 WOG, conventional pattern. (4) Stainless steel one piece ball valve without locking device 2000 WOG, hexagonal type. (5) Stainless steel one piece ball valve with mini switch, double female threaded ends. (6) Stainless steel one piece ball valve with mini switch, female & male threaded ends. Stainless steel 2 piece ball valve, floating type, lever operated, two NTP ends. (1) stainless steel 2 piece ball valve 1000 WOG, light type. (2) stainless steel 2 piece ball valve 1000 WOG, heavy type. (3) stainless steel 2 piece ball valve 1000 WOG, DIN 3202 M3. (4) stainless steel 2 piece ball valve 1000 WOG, with mounting pad. (5) stainless steel 2 piece ball valve 2000 WOG. Stainless steel 3 piece ball valve, floating type, both NPT ends. 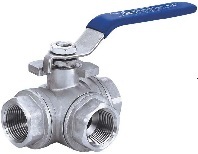 The body of a stainless steel 3 piece ball valve is made up by three parts: left bonnet, mid body, and right bonnet. Usually the 3 parts are bolted up outside the body to insure tight body sealing. The three piece body design facilitates easy and convenient maintenance on site as well as flexible end connection selection. (1) stainless steel 3 piece ball valve 1000 WOG, light type. (2) stainless steel 3 piece ball valve heavy type, 1000 WOG. (3) stainless steel 3 piece ball valve DIN 3202-M3 type. (4) stainless steel 3 piece ball valve 1000 WOG, light type with mounting pad. (5) stainless steel 3 piece ball valve 1000 WOG, heavy type with mounting pad. (6) stainless steel 3 piece ball valve 1000 WOG, pneumatically driven. 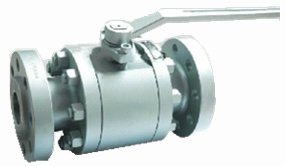 A stainless steel wafer type ball valve, floating ball design. The stainless steel wafer ball valve is designed to a short face-to-face length for the use of limited space in some piping systems. It inherits the good flow characteristic that arises from a ball valve which has a very small pressure drop. The valve body is usually one-piece integrally designed to ensure tight body sealing. 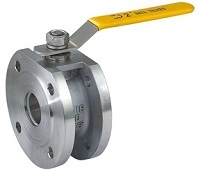 Wafer ball valves can be easily installed, operated and maintained. (1) stainless steel wafer ball valve 150LB with mounting pad. (2) stainless steel conventional type wafer ball valve 150LB. (3) stainless steel wafer ball valve DIN PN16/PN40 with mounting pad. (4) stainless steel wafer ball valve DIN PN16/PN40 without mounting pad. 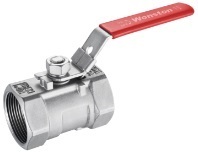 A stainless steel 3 way ball valve, NPT connetion, floating type. 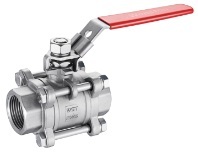 The stainless steel 3 way ball valves manufactured by Metals Valve are mainly furnished with NPT, BSP or BSPT threaded ends in sizes 4″ and smaller. They are designed to floating type and can be further categorized as L port and T port depending on the allowable flow directions passing through the passage. A L port 3 way ball valve can switch on two flow directions that are perpendicular to each other while the T port 3 way ball valve can switch on two or three flow directions. (1) stainless steel 3 way ball valve 1000WOG, HP Type. (2) stainless steel 3 way ball valve 1000WOG LP Type. A stainless steel 4 way ball valve, floating type, NPT threaded ends. 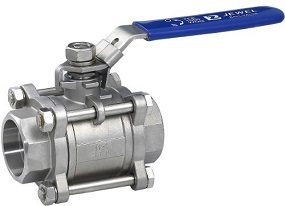 Similar to the 3 way ball valve, a stainless steel 4 way ball valve has four NPT threaded ends which are respectively perpendicular to each other. This valve can handle flows in four directions. The flow patterns passing through the four way ball valve are illustrated below. 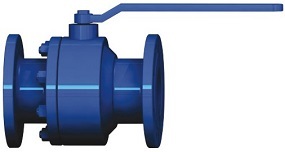 As the most common design, a LL port 4 way ball valve can change the two perpendicular flow passages respectively to the opposite directions by simple quarter-turn operation. The flow patterns of a stainless steel 4 way ball valve, floating type, NPT ends.